Enough of the texting silly pics to friends and let’s get right into some craftiness, shall we? We shall! When I got home from my vacation, I decided to do a big spring clean of my workroom stuff, and in the process I unpacked a box of glass pieces made by my dear friend, Beth, of Glass Tie Studio, that she’d given me to do something collaborative with her, so I had some ideas of what to do with it and decided to get stuck in. Now, I haven’t crocheted anything for ages, and it turned out that I’d jumped in the deep end a bit. Nothing I tried worked out, and I was getting frustrated. The fine thread, the slippery glass and my stupid giant sausage fingers just would not work together. 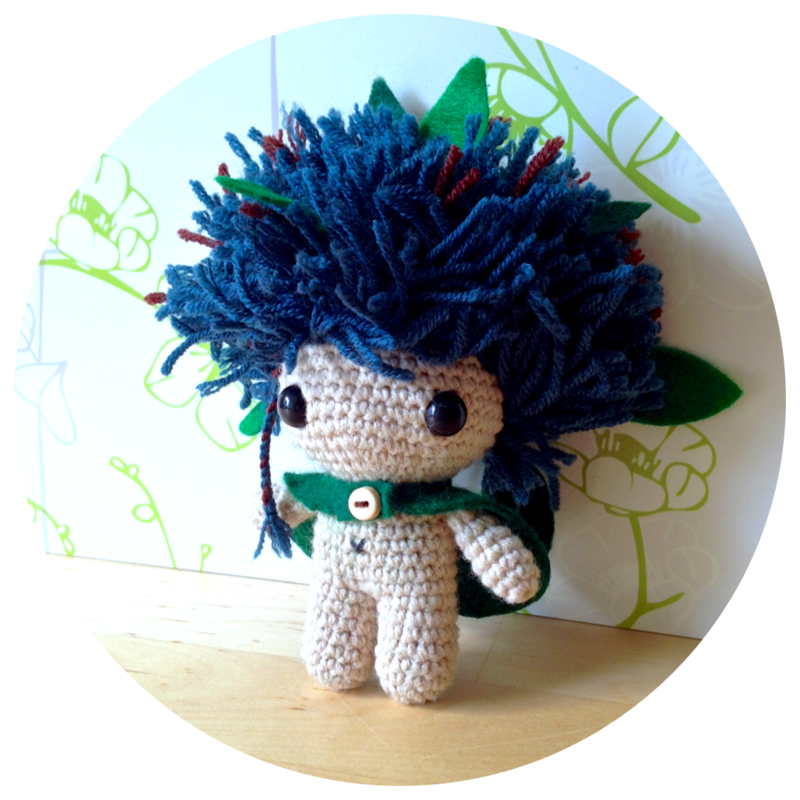 What I needed to do was go back to something familiar to get my crochet mojo back, and so I decided to do a new amigurumi. I mean, I really need to restock the shop too, so I figured it could only be a good thing. I took some yarn that I’d bought at Daiso and just started off with no plans. Gradually, this little fellow started to emerge and he told me exactly what he wanted to be, and who was I to ignore him? 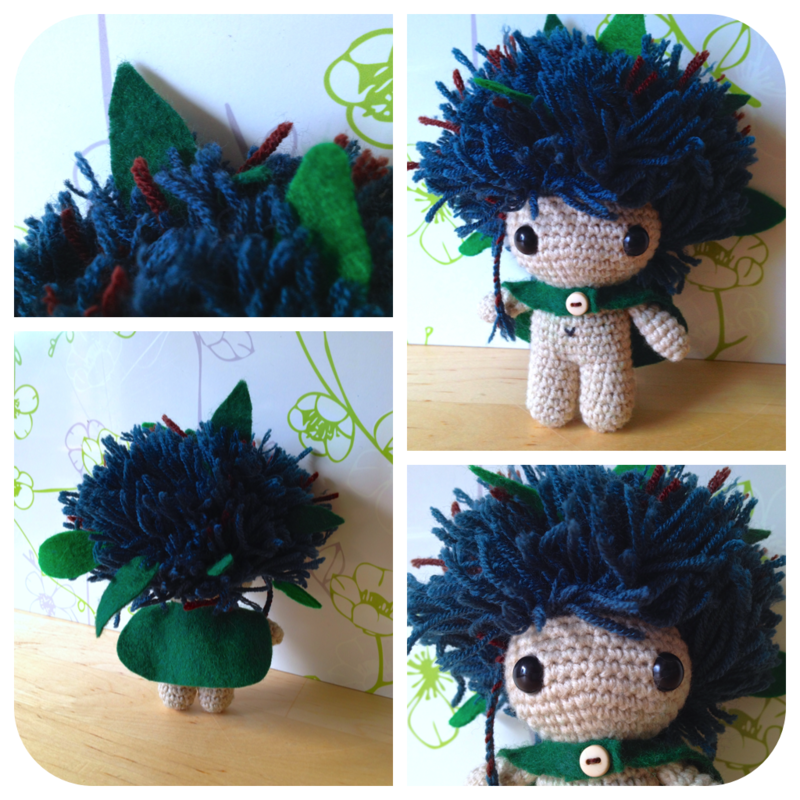 And so, I present to you: Sprout, the little forest imp. I started off with a super basic body using “Gelato de Cotton” which is a cotton-acrylic blend from Daiso (and, I gotsa t’ say, it’s actually super lovely to work with. It’s nice and soft and has a great, subtle texture to it). When I got to his head, I made it shallower than usual, and started decreasing earlier so it came out quite wide but low. After I’d sewn him together, I started to hook in his hair, which took legit actual forever, not even lying. To jazz it up a little, some of the strands of yarn had leaf-shaped felt pieces tied to the end, and then I added a little braid to the side. The yarn is Morris Empire 4ply; the main color is “Rainstorm” and the brown bits are “Clove”. It’s a super nice yarn, but I only had one ball of each so I probably wasn’t going to use them for a knitting project (I do wanna say that I highly recommend this yarn for knitting or crochet projects. I’ve made a sock and a scarf out of it, and it’s sooooooo soft and smooth and really just a delight. It can be a wee bit splitty, but totally worth it, and the colors are divine). I used the same felt for his little cape. The button came from a beautiful little craft care package I got from my friend Kristie of Twistyfishies a few years back, and to me it was just the right touch to finish him off. He’ll probably end up in the store eventually, but I want to wait to have a bunch of stock to list all at once rather than popping them up all piecemeal. Does your crafty mojo leave you every now and then? Do you sometimes focus so much on one craft that you neglect others? Share your missing crafty mojo stories in the comment or on the Facebook page! 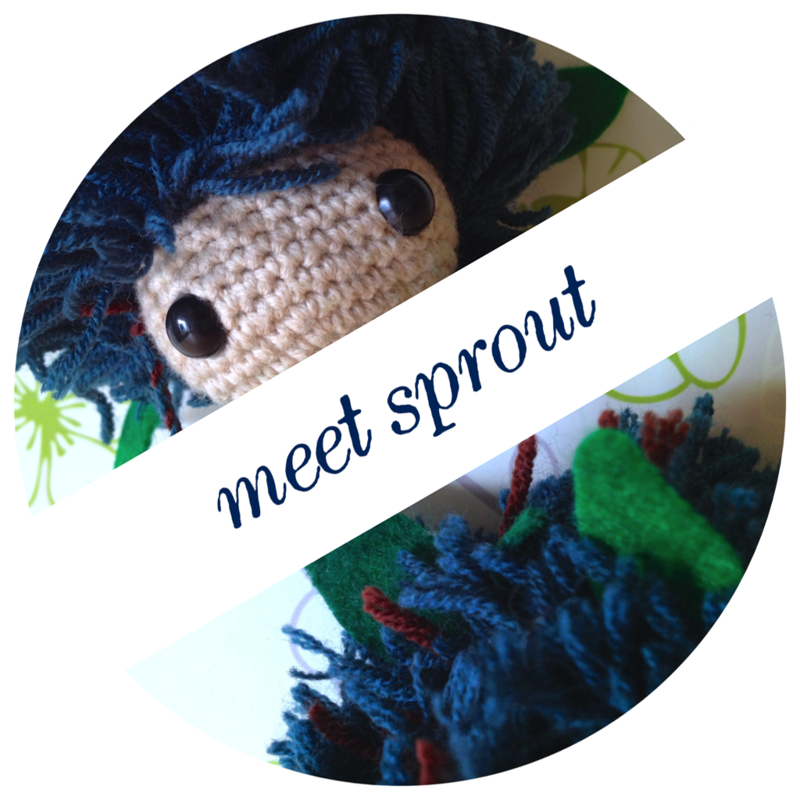 You must make many Sprout friends. He is adorable (and I might want one). And I can hardly wait to see what you do with the glass. Aww, he is so cute! And the hair is AMAZING! Totes worth the effort ^_^ I *always* do the thing where I focus on one craft and forget about the others … right now all I want to do is embroidery! I go between focussing on one craft and ALL THE CRAFTS. I don’t know how I get anything done. Oy. Your post made me go to Daiso and spend a ton of money! NOT EVEN MAD. Loves it.